As the saying goes, no good deed goes unpunished. That's certainly the case when male nurse Samuel (Gilles Lellouche ) saves the life of a patient whose life support has been sabotaged. The patient turns out to be a safe cracker named Hugo (Roschdy Zem) who is being framed for the murder of a wealthy businessman. As thanks for his efforts, Samuel gets knocked unconscious and his pregnant wife Nadia (Elena Anaya) is kidnapped by Hugo's brother Luc (Adel Bencherif). Luc forces Samuel to help Hugo escape from the hospital, but that's only the beginning of Sam's troubles. As it turns out, the same people who wanted Hugo dead kill Luc and take custody Nadia. Now Sam and Hugo must work together to rescue Nadia and clear their names. POINT BLANK (À bout portant) is a classic Hitchcockian thriller in the vein of THE MAN WHO KNEW TOO MUCH where an ordinary everyman finds himself thrust into extraordinary circumstances. The media lumps Samuel in with the criminals, and with several members of the police force, including star detective Werner (Gérard Lanvin) heavily involved in the crime, it's impossible to know who to trust. To be sure, this plot is pretty standard issue Hollywood fluff, even if the movie does come from France. What makes POINT BLANK stand out is the tight and confident direction of Fred Cavayé and universally strong performances that give life to thinly drawn characters. 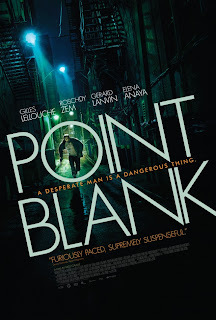 In the end it all comes down to suspense and thrills, and on that front POINT BLANK delivers the goods. 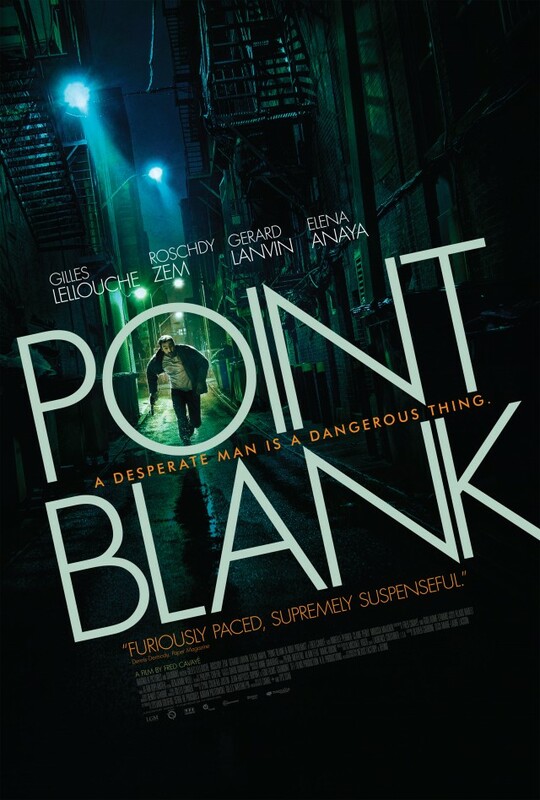 Action films taking place in something resembling the real world have taken a back seat to superheroes and sci-fi this year, so that makes a movie like POINT BLANK seem perhaps a little more fresh than it otherwise might. Still, strictly on its own merits, this is a fun and exciting film full of tense chases and good old fashioned stunt work. And since Hollywood seems so scared of anything even resembling an original idea these days, I'd be shocked if this doesn't get optioned for an American remake, maybe with Matt Damon in the role of Samuel and Vin Diesel or Jason Stathan as Hugo. It might even be about as good, but if you're looking to get your action fix now, don't let the subtitles keep you from seeing POINT BLANK. 3 out of 4 stars.